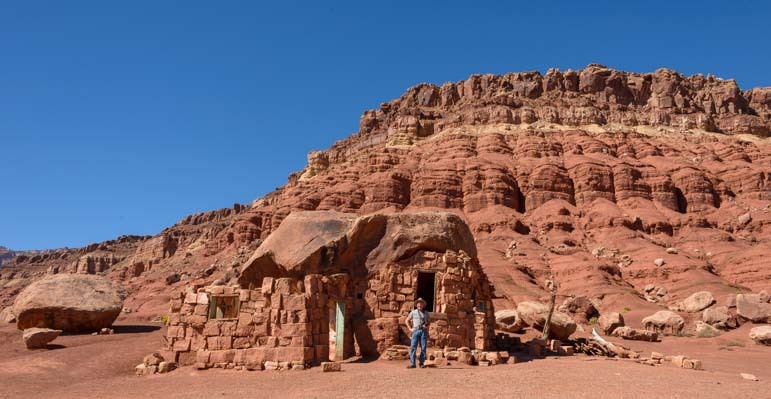 “Cliff Dwellers” on Arizona’s Vermillion Cliffs Scenic Drive – A Fun Stop! 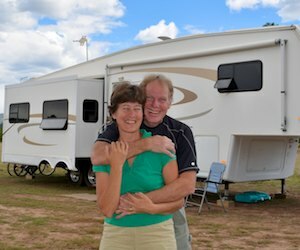 October 2016 – Cutting across the northern part of Arizona from east to west in an RV is a total treat. 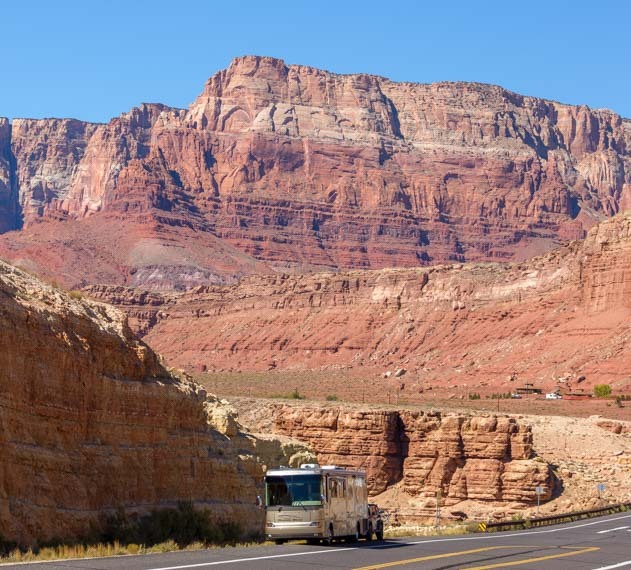 An RV trip through the Vermillion Cliffs area in northern Arizona is a fabulous scenic drive. 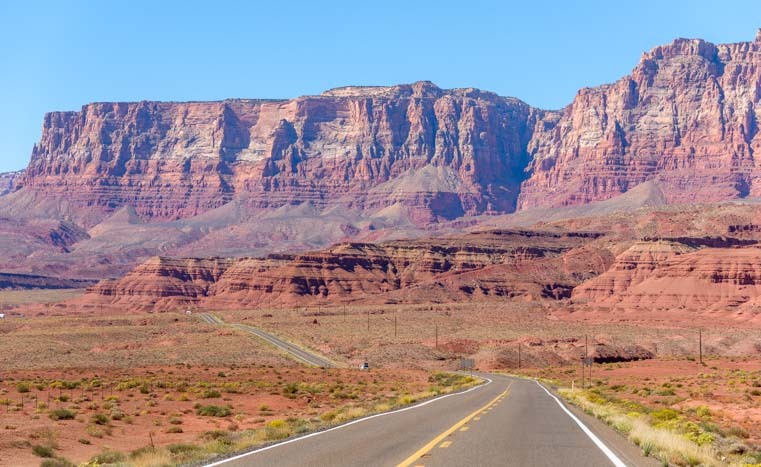 We took US-95 south from Page to US-89A, and then followed US-89A northbound towards Marble Canyon, passing through the stunning red rock scenery of Vermillion Cliffs National Monument. 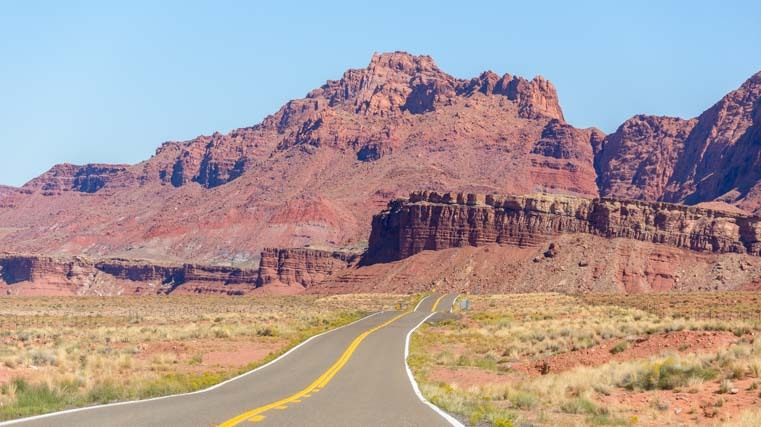 The most spectacular section of this drive does a 180 degree turn on US-89A near Lees Ferry and Marble Canyon. My camera never stops when we drive this part of US-89A! Every time we pass through this region we are blown away by the scenery once again. As I was going through our photos this morning, choosing which ones to include in this post, I was amused to discover that a lot of the photos were essentially the sames ones I had taken from the passenger seat of our truck on previous trips through this area on our way to Kanab and Bryce Canyon years ago, and again this past spring of 2016 on our way towards the Canadian Rockies. It is just that beautiful: even though I have the photos already, I’ve gotta take them again! 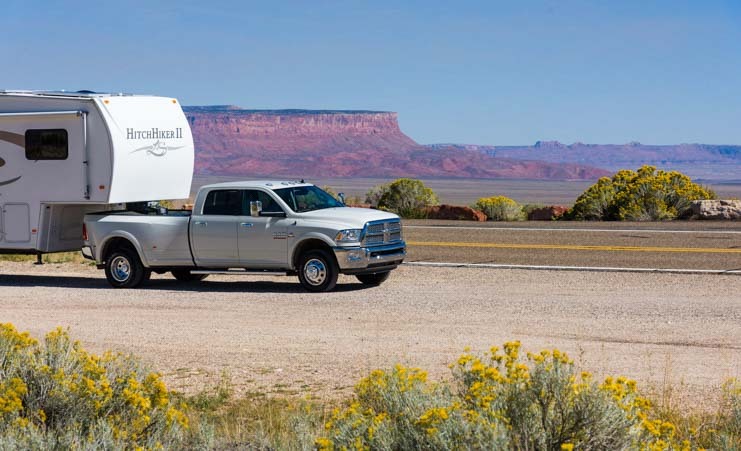 RVing through the Vermillion Cliffs. Wow! 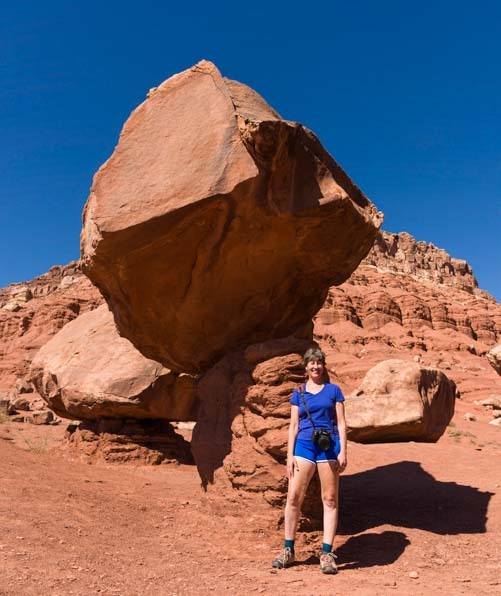 A stop at Marble Canyon and Lees Ferry is an absolute must. We loved visiting that area last spring. 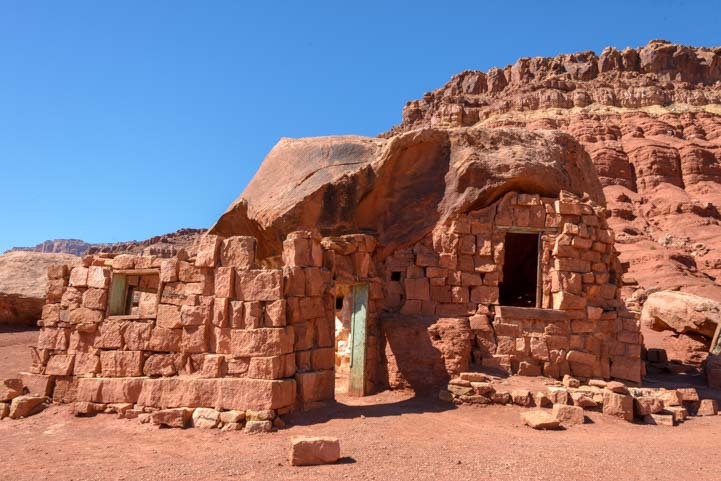 This time, however, we wanted to see something new, and a small roadside stop called Cliff Dwellers was just the ticket. 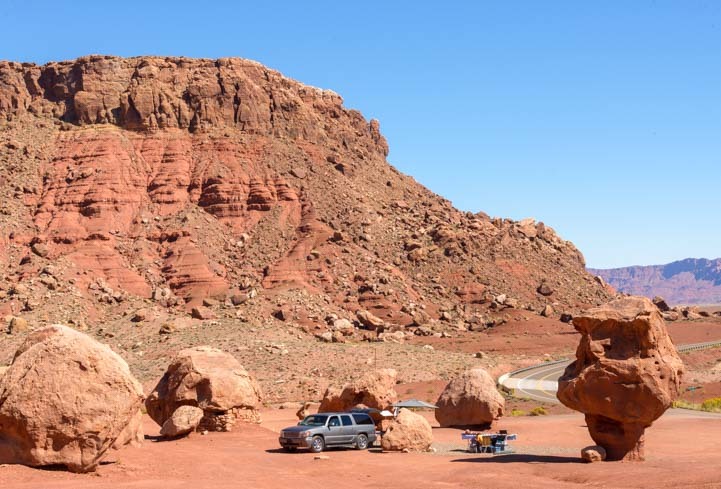 This is essentially a pullout located about 9 miles west of Navajo Bridge at Marble Canyon. 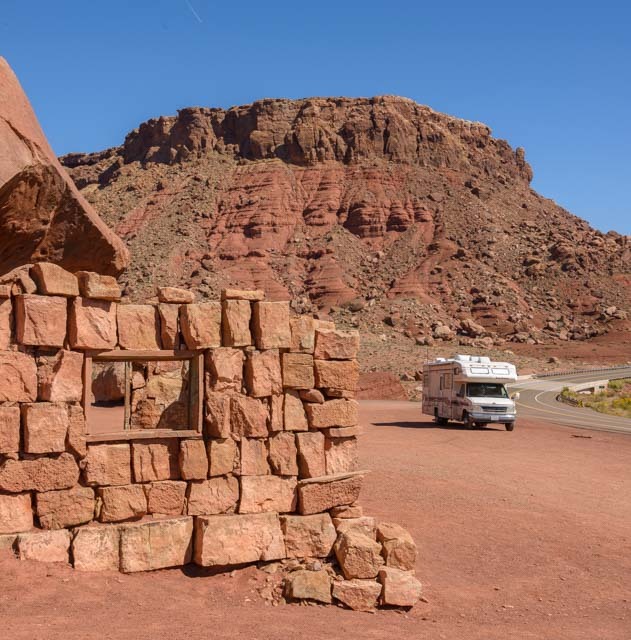 The pullout at “Cliff Dwellers” on US-89A. 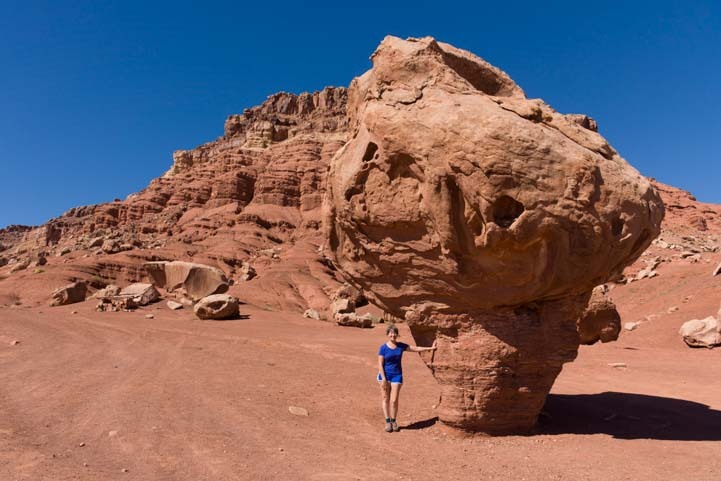 The boulders at Cliff Dwellers are huge! 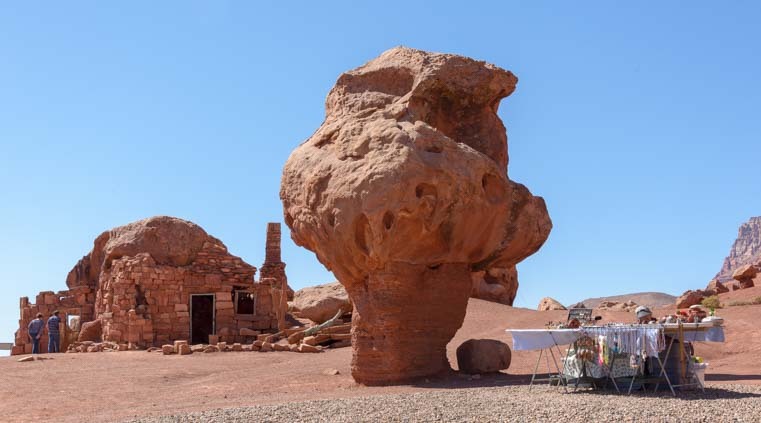 We had no idea what we would find at this roadside stop in the middle of nowhere, but the first thing we saw was a towering mushroom red rock formation. A huge mushroom rock formation towers above me! In the distance there was a rock structure. 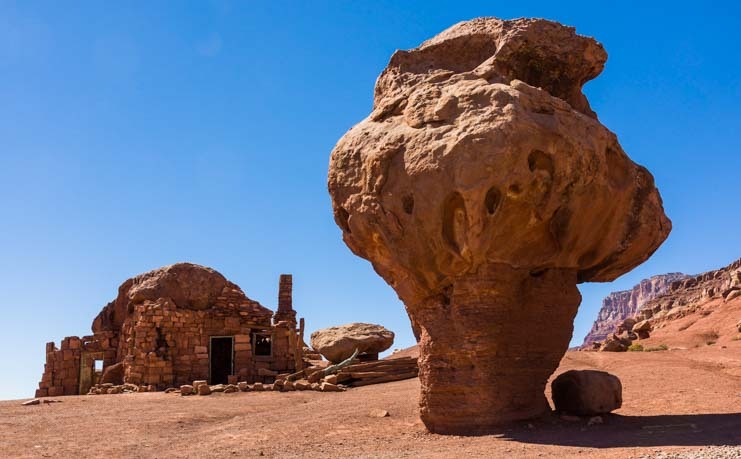 Whoever built this structure had placed red rocks on top of each other to form walls that fit under a huge overhanging mushroom type of boulder which formed part of the roof. 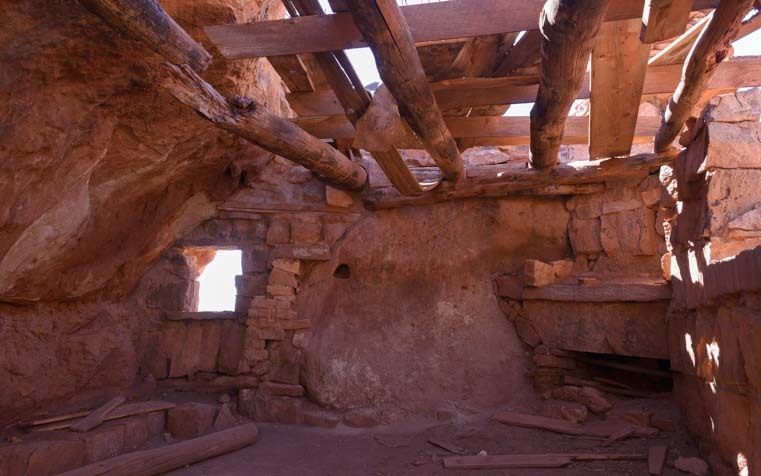 The rock building at Cliff Dwellers isn’t on a cliff, but it probably was a dwelling! 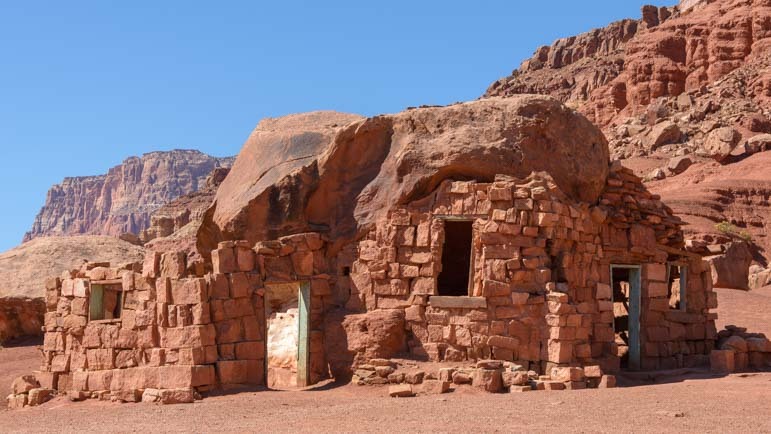 The building is tucked under and overhanging boulder which provides part of the roof. We prowled around the outside and inside of the building, peering through the windows and door. View from the rock dwelling. There were some beams that had once formed a ceiling over part of the structure. Off in the distance, we found a plaque that probably used to describe the history of the structures and the area, but the plaque was empty. So, we just enjoyed roaming around this odd structure. The rock house looks small compared to the huge red rock hill behind. Behind it there was a fantastic red rock hill that had all kinds of striations and textures. Huge white boulders had come crashing down from one of the layers over the years, and they were strewn around the base. Enormous rock boulders had fallen down the sides of this hill and lay around the bottom. 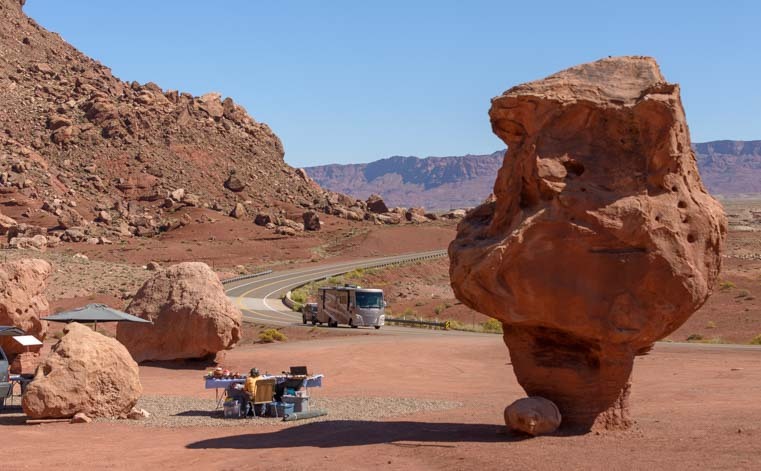 A Navajo woman had set up a folding table to sell jewelry to tourists who stopped by. This little stopover at Cliff Dwellers was a fun way to spend an hour or two. What a great little spot to take a breather in the middle of a truly gorgeous drive! Cliff Dwellers Roadside Stop on US-89A. 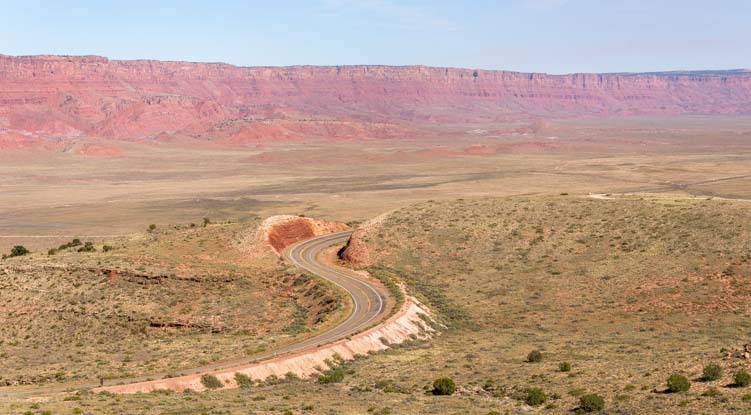 Continuing our drive west along US-89A, we came to the end of the red rock region where the red rocks of Vermillion Cliffs abruptly give way to the evergreens of the Kaibab Plateau. 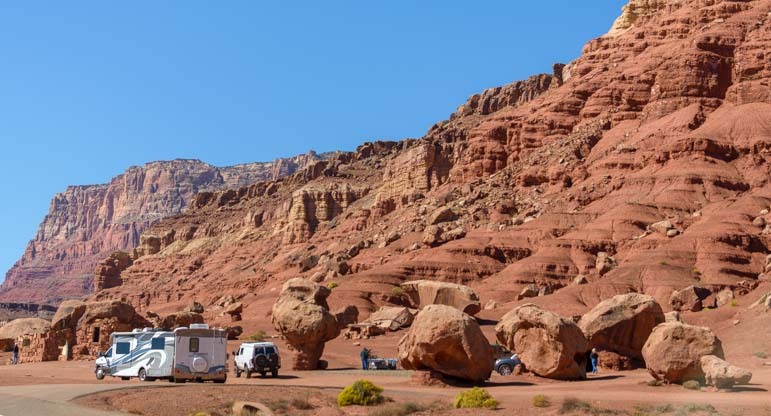 Climbing up a series of tight switchbacks and steep grades, we arrived at a pullout near the top where we could take in the view in all directions and see this incredible transition in the landscape from red desert to green forest. 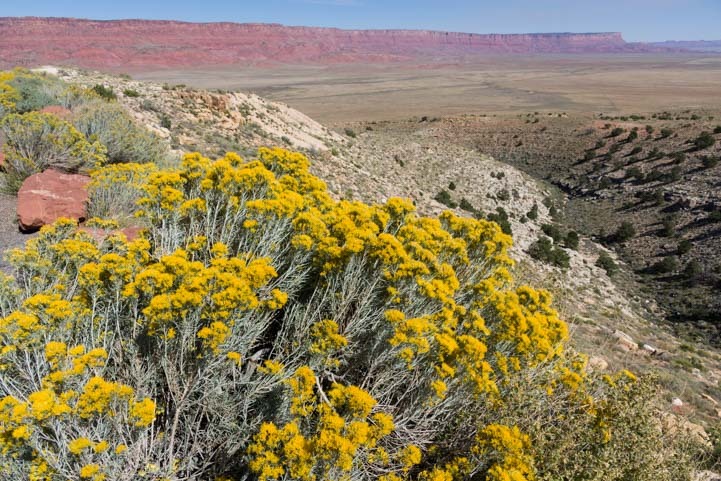 On one side there were beautiful yellow wildflowers that set off the red rock cliffs in the distance. 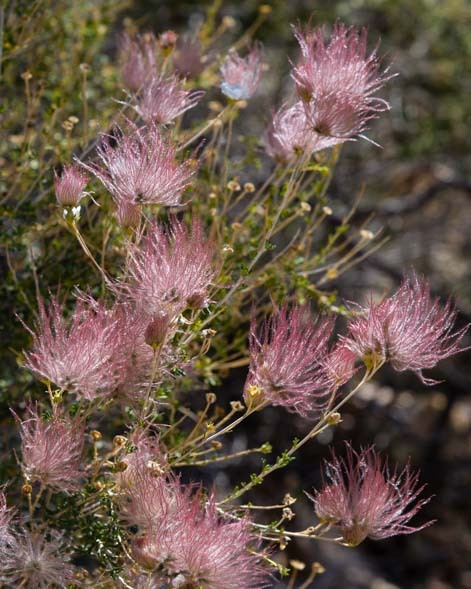 There were also some beautiful pink fairy dusters in bloom. Looking east back down the way we came, the road cut a cool s-turn through the desert. 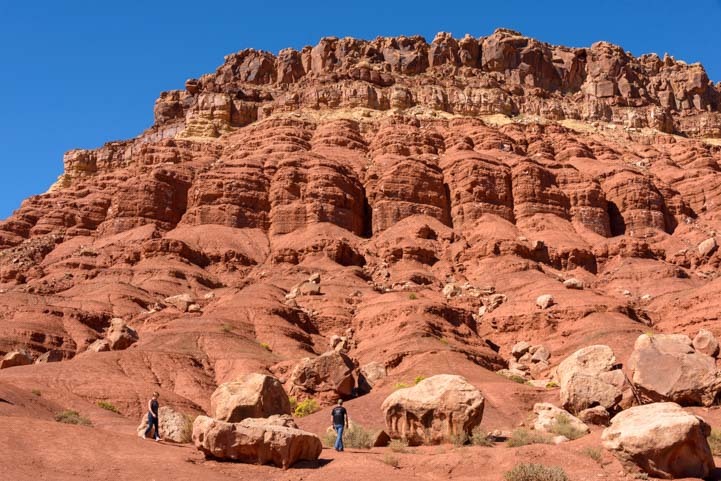 Looking back towards the red rock cliffs. 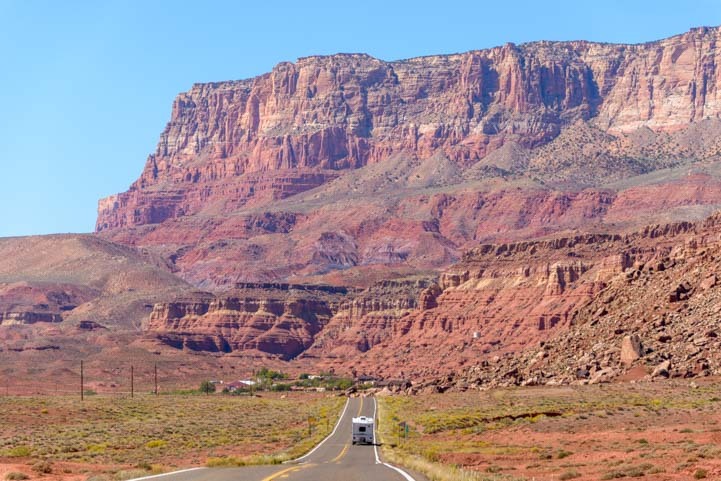 And looking to the north, we saw the very cool divide between the red rocks of the desert and the green hills leading up to the very dense Kaibab forest that surrounds the Grand Canyon. 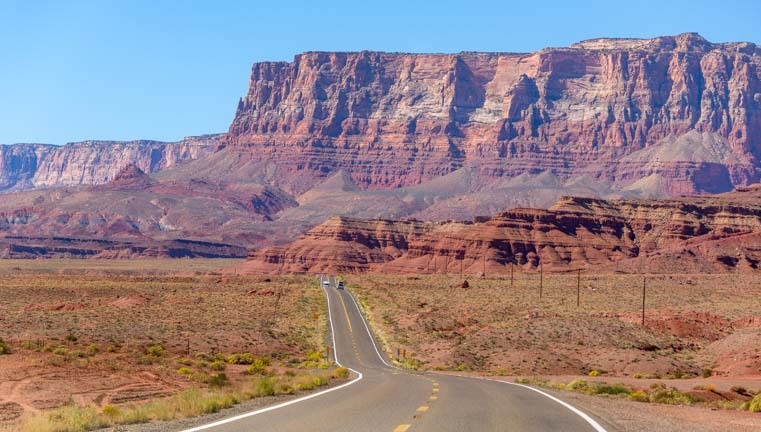 The red rocks of the desert give way to the greenery of the forested Kaibab Plateau which surrounds the Grand Canyon. More about the Grand Canyon in our next post!! 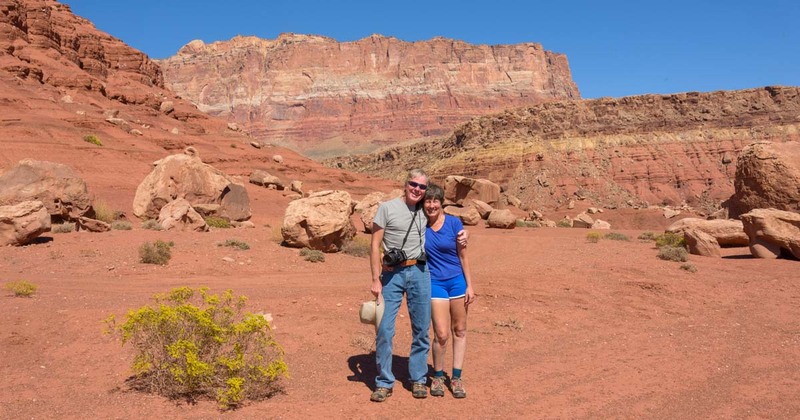 In the meantime, there are links for Vermillion Cliffs below. Lovely area! I’ve have enjoyed as well. Thanks for the memories! Thanks, Tom. It’s worth going back again and again!! I finally got a chance to look at this post! beautiful, even with all that red rock! We awoke to 7 degrees above zero this morning so this was a warming collection of photos, Mark and Emily! As alwasy, thank you so much for sharing this beauty. Oof! That’s a bit cold, Pete! We’re basking in 84 degrees in our buggy right now in Arizona!!! 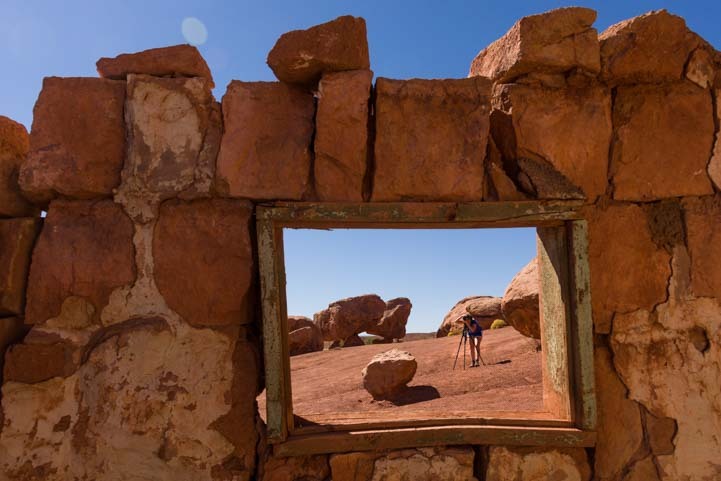 How wonderful to know that our photos are inspiring your scenery descriptions in your sequel novel! 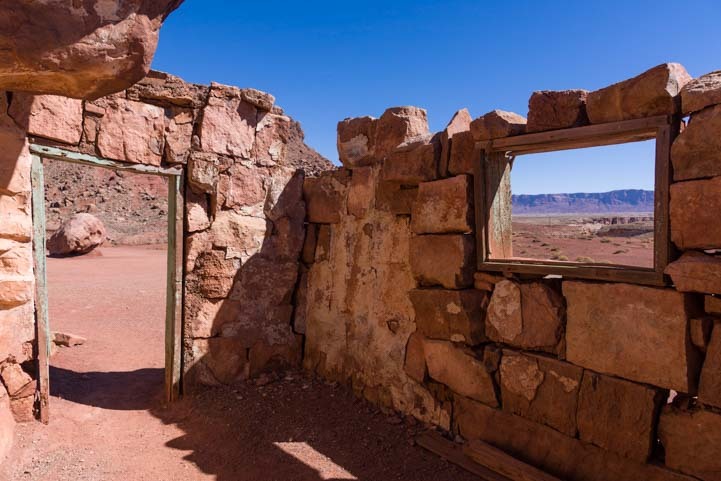 The Vermillion Cliffs are stunning, and traveling through there with a horse and wagon would be truly magical. Good luck with your novel and thank you for letting us know!